The mudroom is quickly becoming one of the most essential spaces in a Minnesota home. Without a mudroom, our long winters and rainy days lead to cluttered entryways, piles of gear by the back door and more. With a well-organized, beautifully designed mudroom, you have a space for everything that is easy to use and easy on the eyes. Most entryways in older homes are small, however. The trick here is to creatively use the room you already have. This allows you to make the most of your space and your budget. Here are a few mudroom ideas for small spaces to help you get started. The biggest preconceived notion that folks have about mudrooms is that you need a whole room. The truth is that all you need is a bit of wall space that you can transform for the utmost in utility. Here’s what you do. You buy or build a custom bench that has room underneath it to store shoes out of the way. You hang coat hooks on the wall above the bench for coats, umbrellas, backpacks and other items. Then you place a shelf above those hooks, upon which you store baskets for capturing other items that can get away from you, such as mittens, hats, sporting goods or gardening gloves. If you’re like many Minnesotans, you use your back door or sliding glass door to enter and exit your home. This door often opens directly into a kitchen or dining space. Adding coat hooks and a bench just won’t do much for design appeal in spaces like these. 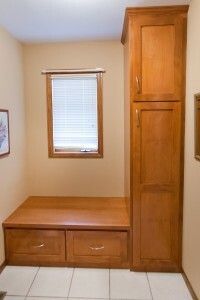 In such situations, your best bet is to hide your items in a custom closet or cabinet. You open the doors to find everything you need tucked away nicely, including a hanging rod, a bench to sit on, and a place to put your shoes. If you build in separate cubbies for each family member, consider also adding electrical outlets for charging phones, tablets and other electronics. This will keep items off your counters, and hopefully cut down on the, “Mom, I can’t find my phone!!!! !” comments. Have pets? Take them into account when building out your space. If possible, add in a small sink for washing paws. Build in space for pet food and bowls. Add a hidden oasis for your pup by putting a doggie bed in an open cubby on the floor. Don’t forget to add some style! A functional space can also be a beautiful one. Add in design elements from other areas of your home for personality. One great idea is to build in a small shelf for decorative items. 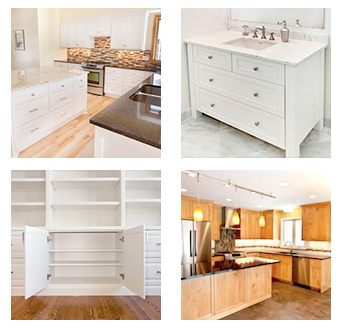 At Artisan Cabinets, we know how to create the right storage space for your entryway or hallway. If one of the mudroom ideas for small spaces above is just what you’re looking for in transforming your current space, get in touch! Call us at 952-737-7088. Or, if you have another clever idea for a mudroom that we didn’t list here, we welcome you to share it with us in the comments below.